Percorri un tubo in uno dei numerosi fiumi di acqua dolce della Dominica in questa escursione a terra. Sperimenta il lussureggiante scenario tropicale di Dominica sul safari di tubi di fiume mentre la tua nave da crociera è in città. Godetevi i rinfreschi gratuiti e il trasporto di andata e ritorno dal porto delle navi da crociera di Dominica. Dopo il molo delle navi da crociera al porto di Dominica, prendi il tuo veicolo per il tragitto di 30 minuti attraverso l'interno lussureggiante dell'isola fino al sito di lancio per la tua avventura sui tubi del fiume. Ascolta un breve briefing sulla sicurezza e ricevi la pagaia, il salvagente e la camera d'aria modificata. Lancia il tuo tube e segui la tua guida lungo il fiume, ruotando delicatamente nella corrente. Fermati lungo la strada per nuotare nell'acqua fresca prima di continuare la tua avventura. Chiedi alla tua guida esperta qualsiasi domanda sul modo, compresi i puntatori per il paddle e tutto ciò che vuoi sapere sulla flora e la fauna locale. La tua sicurezza e il comfort sono la loro priorità assoluta. Quando navigherai al centro di accoglienza di Hillsborough, tirerai il tubo sulle rive e godrai del punch al rum e frutta fresca locale. Quando il tuo safari in tubing termina, goditi il ​​trasporto fino al porto crocieristico di Dominica in tempo utile per prendere la tua nave in partenza. We booked this shore excursion with viator instead of the cruise line . We find that the excursions are smaller and more personalized with Viator. This certainly was the case with this excursion we were the only two people on the tour. We were picked up on time and had no trouble finding the meeting place. It was a relatively short and pleasant drive out to the river. The float was rather leisurely as the water level on the river was pretty low. The guide was very nice and made every effort to see that we enjoyed ourselves. If you're looking for high adventure this tour may be to leisurely. However, if you are looking for a leisurely trip down the river while enjoying the view of the natural beauty of the island this is a good choice. Great company! Tubing was great and the staff was awesome, always looking out for us and lots of fun! Even our driver that picked us up at pier was so knowledgeable about island. It was like 2 tours in one! The Rocky Rollers were amazing! 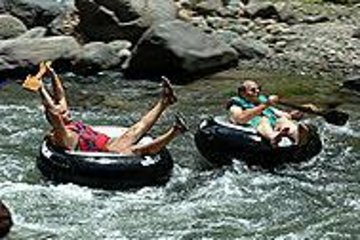 Responsibility and a good time go hand in hand on this river tubing tour. Myself and 11 others took this tour and had a great time. These guys take excellent care of you and are always on the lookout for your safety. The scenery is spectacular and the guides too! Great trip. Guides were excellent and all seven of us had a wonderful time. It was a tad bit confusing finding our transportation, but everyone at the port went out of their way to help us. The Wackyrollers company was great!. The guides were friendly, helpful and made sure we had a fun time. the water in the river was low, but that was no one's fault and the guides would push us along in the low spots. The fruit at the end was wonderful and the rum punch was very strong!! Book this excursion--you'll have a blast! Our tour was a very good time. We were picked up in a timely fashion from the ship, had an interesting conversation about Dominica with our driver who told us lots of facts about the area we were visiting, then delivered us safely to our destination. The crew at did a great job. The equipment was of good quality and in good repair and there was a safety instruction before we took to the river. Wearing helmets and life jackets we jumped on our tubes and began the float down the river. There were some mild riapids along the way and we enjoyed the beautiful scenery and interaction with the crew. The river was a bit low, because of the season so our trip was not as swift as it would have been with higher water but we all had a good time. At the end of the trip there was some refreshments...soda and rum punch and some fruit to snack on. We were then transported back to our ship. All in all it was a very good day. Our time on the river was quite long compared to other river tubing adventures we had done in the past. We would recommend this tour to anyone visiting Dominica ! The guides were very nice and we really enjoed the trip down the river.